Professional Basement Conversion: Conifer are a small but highly professional business specialising in basement or cellar conversion and tanking. stone buildings and buildings of solid-wall construction are our specialism! We work all over the region, including Chester and Cheshire West. More living space is always welcome, you may be surprised at the difference a cellar conversion can make to your property. How about a home gym? A studio or study? A children's play room? An office space? A pool or games room? Large-screen, home cinema? The possibilities are endless! Increase the value of your home with our luxury basement conversion services by Conifer. Specialists in effective membrane damp-proofing methods, and using up-to-date cavity drain membrane and Vandex Slurry damp proofing technology, Conifer's team of experts will convert your disused basement to the living space of your dreams. Over the course of many years we have helped people in the Chester and Cheshire region with all kinds of damp proofing related issues. Our combination of high quality building work combined with specialist damp proofing knowledge makes Conifer an ideal choice for your conversion project and you can rest assured that your basement /cellar will be waterproofed properly and finished with excellence. 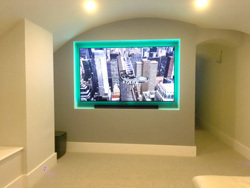 Click here to see why you should call Conifer for your basement conversion!